Kidderminster College is taking part in Jeans for Genes Day on 23rd September and in return for a donation of £2 (or more) everyone can come to work in their jeans! This year the charity’s theme is ‘overdo it in denim’, because if you do more, they can do more. So the more denim the better! Denim coats, denim bags, denim hats, denim shoes…just overdo the denim! 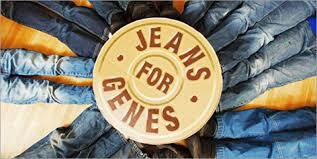 If you can’t wear jeans that’s okay, there is no reason why you still can’t be part of Jeans for Genes Day. Why not keep it simple and wear something blue for example, socks, tie, scarf, piece of blue hair extension, make up…. be creative! There are between 4,000 and 6,000 diagnosed genetic disorders. It is estimated that one in 25 children is affected by a genetic disorder and therefore 30,000 babies and children are newly diagnised in the UK each year. By wearing our jeans and making donations we will change the lives of these children. The cafe will be selling cupcakes, if you are good at baking, why not bake something blue and give the Great British Bake Off a run for their money!